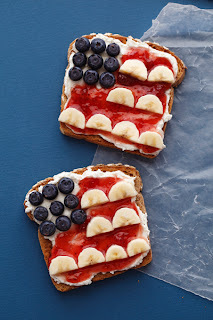 Simple Flag Sandwich is made with a red fruitr roll up, a pretzel stick, some blueberries, and a piece of white cheese. Independence Day Toast. Just put cream cheese on the toast, then add blueberries, banana slices, and a little strawberry jam to make a flag design. Fireworks Cake; this looks very do-able. It's just a cake with red, white, and blue cake batter mixed together. Hidden Flag Cake. This is more challenging, but will amaze everyone! Cupcake Flag "Cake." Easy peasy. Patriotic Biscuits are made with stencils and food coloring. Independence Day Cupcakes in a Jar.Cute! 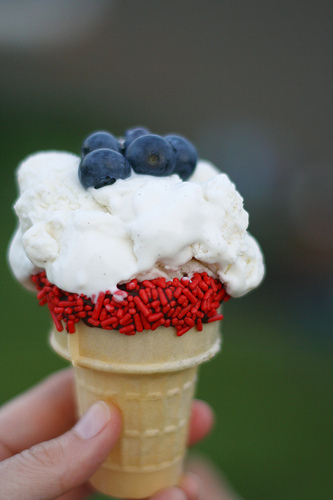 Patriotic Ice Cream. So very simple; just put any white ice cream in a cone. Top with some blueberries and add red sprinkles to the bottom. Find more food ideas in my 2011 Independence Day post, including a flag lasagna, patriotic strawberries, flag pops, flag kabobs, a flag berry pie, and more. * Make cupcakes with easy-to-print and create images of the presidents on them. * Make a popsicle stick White House. * Throw a President's Day party packed with foods the presidents loved. * Do alphabet code games for George Washington and Abraham Lincoln. * Play "Rescue Flat George" with a dollar, some quarters, and a bottle. * Make simple presidential finger puppets. * Color some Abraham Lincoln or George Washington coloring pages. * Do some online President's Day jigsaw puzzles. * Make a paper plate hat like President Lincoln's. * Turn yourself into Honest Abe. * Do some President's Day research projects - and learn to draw the presidents. * See some great images of Washington and Lincoln, read quotes from both, and read famous stories about the Presidents, including Washington and the cherry tree and a story about Lincoln's youth, all in a free ebook. 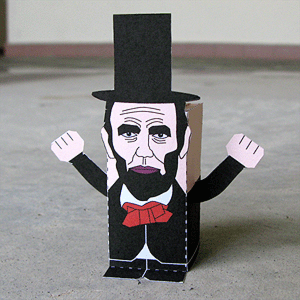 * Create a toy Abe Lincoln from paper. 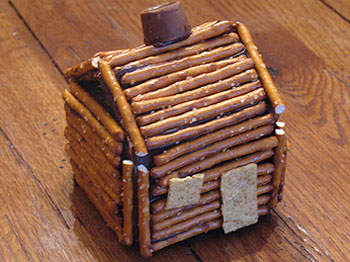 * Create a model of George Washington's Revolutionary War camp. * Make a mini Mt. Rushmore, using coins. * Play George Washington games online. 1. Sadly, many Americans don't know why we have parades, fireworks, and barbecues on July 4. So I'll start by telling my kids what Independence Day is all about. (Hint: It's the day we celebrate the colonists breaking away from England, as put forth in the Declaration of Independence.) Here is a simplified version of the Declaration of Independence I will share with them. (Read the Declaration in its original language here. 2. Baking lasagna that looks like the American flag. 4. Turning strawberries into red, white, and blue delights. 5. Making easy red, white, and blue popsicle or more elaborate watermelon star pops. 6. Baking cupcakes with white frosting and red and blue sprinkles, then top them with images of U.S. presidents and founders (images here, at Family Fun). 7. Making a super easy flag fan or slightly more elaborate round flag fans. 8. Helping the kids learn their states with this lovely United States of America map craft. 9. Putting together fun and simple flag kabobs with blueberries, strawberries, and bananas. 10. Making flag hats and flag chair covers. 11. Printing out and assembling a star spangled banner. 12. Making star spangled fruit treats. 14. 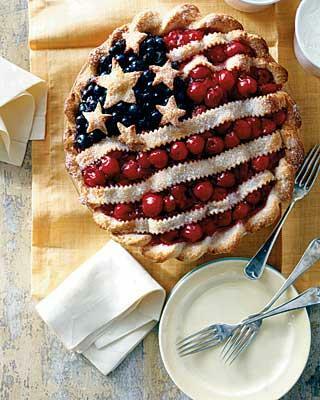 Or baking this stunning but not complicated flag pie with cherries and blueberries. 15. 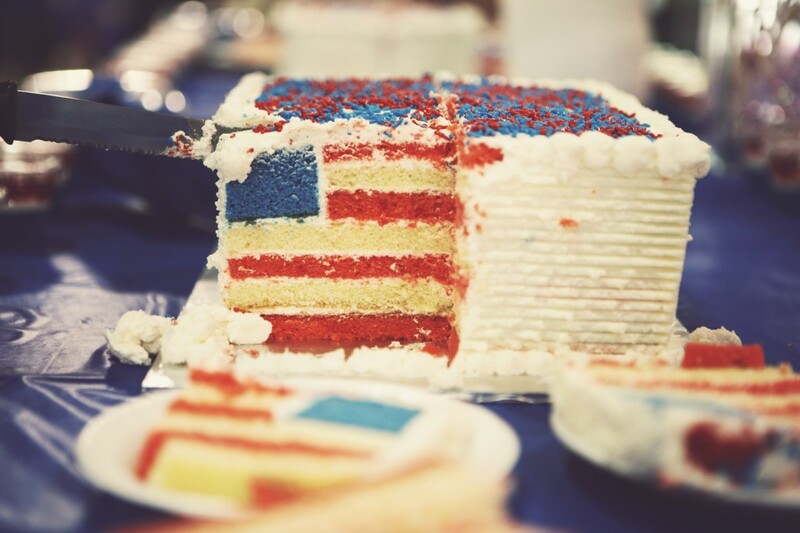 Make a layered flag cake. 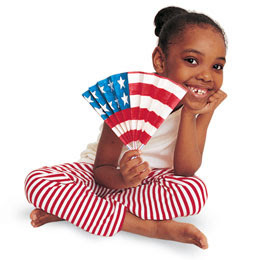 How will you make your Independence Day special this year? * The Constitution for Kids: Digital copies of the Constitution, age appropriate teaching aids (for kindergarten through high school), photographs of the original Constitution, and much more. * The Heritage Foundation: A brief introduction to the Constitution, and free booklets of the complete text of the Constitution. 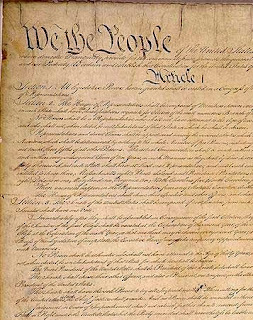 * Constitution Facts: Constitution-related projects for kids of all ages. 'But what is a 'Yankee Doodle?' And why would anyone call a feather 'macaroni?'" Find out at Smart Central. And just why do celebrate our independence on July 4th? That wasn't the day the Continental Congress declared independence. It wasn't the day Thomas Jefferson wrote a first draft of the Declaration, or the day the Declaration was presented to Great Britain. Or even the day the Revolution started. 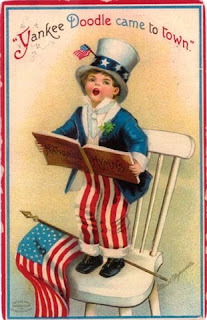 Find out why July 4th is so special over at ConstitutionFacts.com. 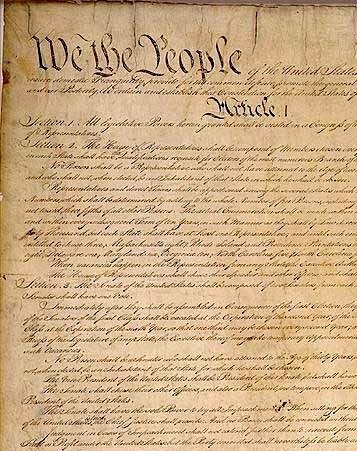 Want to understand the U.S. Constitution but get bogged down in all that out of date language? Try The Constitution in Plain English. Here's the Declaration of Independence in modern English, too. Want to know how the Constitution has changed since the Founding Fathers created it? Check out USConstitution.net. How about original U.S. documents from the 18th and 19th century, like Federal proclamations for days of prayer and documents that show a more positive side to black history? You'll find copies at WallBuilders. Finally, if you think the U.S. is a democracy, find out why it's NOT over at This Nation.